All the hoop courses I’m running in Brighton and Hove starting September/October including Beginners, Super Hooper Sequences and Hula Fitness, get booking soon so you don’t miss out! Build core strength and cardio fitness as you learn how to spin an adult-sized hula hoop on your body and in your hands. 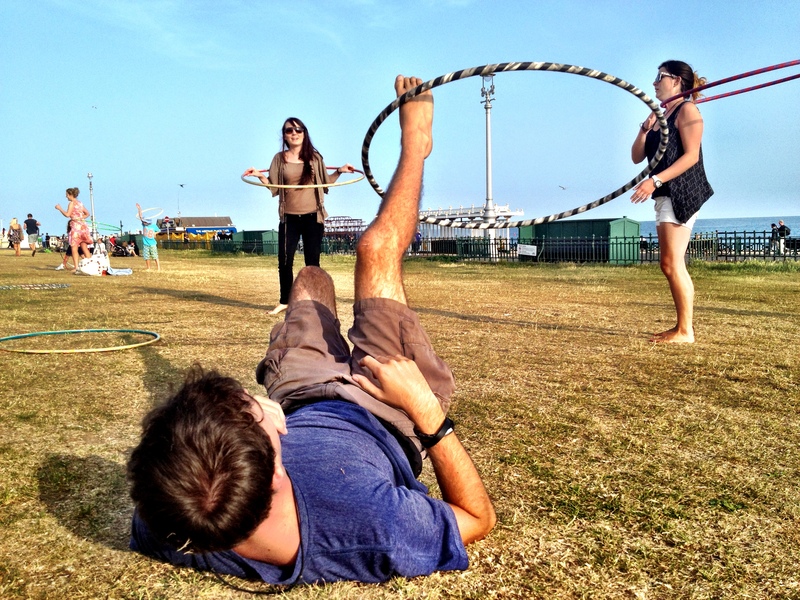 Whether you’re after a fun workout, a new circus skill to show off at festivals, a way to de-stress, or something extra to add to your dance routine, hooping has got something for everyone. Suitable for all ages, no experience necessary. Each week in this multi-level course we will learn a variety of new tricks and spend time putting them all into a flowing and easy to remember sequence. So by the end of the course you will come away with at least 8 short, fun sequences of moves that you can bust out at any time. Plus, we will also spend time looking at your own personal trick ‘vocabulary’ and come up with your own original combinations. Guaranteed to help you flow more with you hoop and break through any hooping ruts! The class starts with an upbeat warm-up and then goes straight into aeorobic exercises using the hoop as added resistance. You’ll spin the hoop on different parts of your body and get your heart rate up as we move around in simple and easy-to-follow steps. You’ll learn tricks that will get your muscles working plus play some energising games to build up a sweat! The class will finish with some HoopYoga, using the hoop as a tool to stretch out your muscles and increase your flexibility.